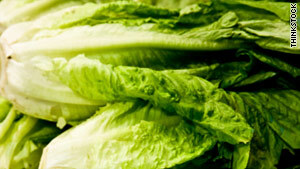 Romaine lettuce, sold under the Freshway and Imperial Sysco brands, was recalled. (CNN) -- A multistate romaine lettuce recall because of fear of contamination with a potentially deadly bacteria has restaurants east of the Mississippi River scrambling to assure customers that their salad is safe. "We have taken the extra precaution of contacting our lettuce supply chain partners to ensure that our product meets our usual high standard of quality," New York-based franchise Just Salad said in an e-mail to its customers. "We are happy to say that we have confirmed that this recall will have no effect on Just Salad's romaine lettuce," the e-mail said. On Thursday, Freshway Foods in Sidney, Ohio, announced a voluntary recall of products containing shredded romaine lettuce with a use-by date of May 12 or earlier because they may be contaminated with E. coli linked to outbreak of illness. Yum! Brands -- the largest restaurant company, and owner of popular fast food chains KFC, Pizza Hut, Taco Bell and Long John Silver's -- said Freshway Foods is a not supplier to any of its brands. The romaine lettuce, sold under the Freshway and Imperial Sysco brands, was recalled in connection with an E. coli outbreak that has sickened at least 19 people in Michigan, Ohio and New York. Most E. coli strains are harmless, but some cause severe illness. Diarrhea, urinary tract infections, pneumonia and other respiratory illnesses are just some of the consequences of ingesting certain kinds of the bacteria. The lettuce under recall was sold to wholesalers and food service outlets in Alabama, Connecticut, the District of Columbia, Florida, Georgia, Illinois, Indiana, Kansas, Kentucky, Maryland, Massachusetts, Michigan, Missouri, New Jersey, New York, North Carolina, Ohio, Pennsylvania, Rhode Island, South Carolina, Tennessee, Virginia, West Virginia and Wisconsin. Freshway Foods also advised consumers not to eat "grab and go" salads sold at in-store salad bars and delis at Kroger, Giant Eagle, Ingles Markets and Marsh stores in 23 states and the District of Columbia. The Freshway recall does not affect bagged and prepackaged romaine lettuce mixes sold in the produce section. "It is important to note that bulk and prepackaged romaine or bagged salad mixes containing romaine that were purchased in supermarkets are not included in this recall; Freshway Foods does not produce these products," Freshway said in a statement. Consumers with recall questions and concerns can contact Freshway Foods at 888-361-7106 or visit its website, www.freshwayfoods.com.